Cabin Rental Guests in our area tend to enjoy a few local favorites for their holiday dining or family reunion meals. One of these special restaurants would be the Apple Barn in Sevierville, Tennessee. The Apple Barn really is a barn, it was built back in 1910 and was part of the farm bought in 1972. The owners tell their story: “We planted our first trees in 1976 and we plant more every year. Our orchard now numbers over 4,000 trees. We began renovating the old cattle barn in 1980, scrubbing it clean as a whistle, one board at a time. Structurally, we left it pretty much as it was, merely putting a clear sealer on the black walnut and wormy chestnut wood, and retaining the stables and feeding rack. 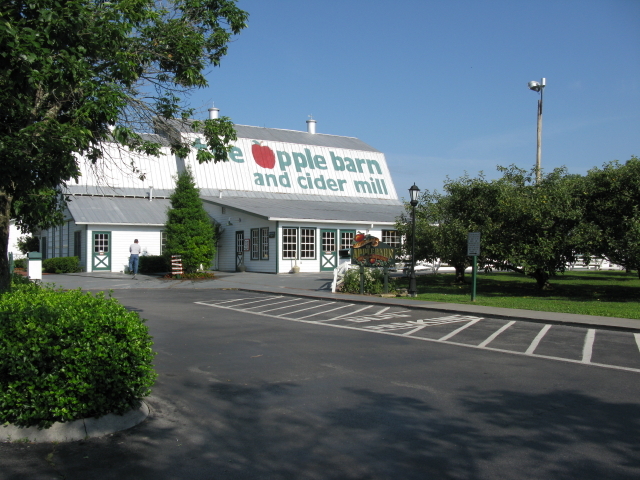 The sturdy old barn began a new era as The Apple Barn in 1981. Soon, we added a Cider Room where you can actually watch the variety of juicy sweet and tart apples being pressed into delicious cider in the fall. Folks say our cider is the best they’ve ever tasted! Requests for a glass on the spot led to opening the inviting Cider Bar, where folks can sample our sippin’ cider hot or cold, while admiring the beautiful cherry and onyx back bar. Well, with all those apples we just naturally had to include the Apple Pie Kitchen, where we bake delicious treats like fried apple pies, apple doughnuts, and apple dumplins for eating there or taking home. Over the past 20 years, with the support of an apple loving public, we have grown “like Topsy”. With a lot of planning and thought, we have been able to present our unique applewood smoked hams and bacon; introduce our own very special apple butter from an old time mountain recipe; add the Candy Factory which produces original sweets, including old-timey favorites, handmade on century-old equipment; and develop recipes for making our own ice cream for “The Creamery” ice cream parlor, starring apple specialties. Our expansion included the renowned original Applewood Farmhouse Restaurant. It soon became apparent that if we wanted to serve everyone who wanted to dine with us, another restaurant was necessary. The Applewood Farmhouse Grill opened in 1995, along with the Apple Barn Winery, specializing in delightful apple and fruit wines. The next time you book a mountain cabin, mountain chalet, or mountain villa in the Smokies, I recommend you try the Apple Barn Restaurant. I love the Apple Julip and Apple Jam. 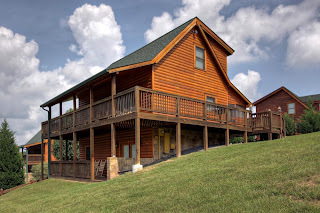 You can bring it back to the Gatlinburg cabin & enjoy it the next morning, waking up to the mountains!